The Druze Community (Druzim in Hebrew) have lived in the Galilee and Carmel area (in northern Israel) for a thousand years. Even though the Druze language is Arabic, their religion and culture is separate and unique. They speak a special dialect of Arabic that sounds much like Syrian dialects of Arabic. They are neither Muslim nor Christian. They number about one and a half million in the world; but the vast majority live in the Galilee, Southern Lebanon and Southern Syria. Most of the Druze towns and villages in Israel are located in the north of the country, mainly on hilltops; historically as a defense against attack and persecution. They are fiercely loyal and equal citizens of Israel. The Israeli Druze serve mandatory service in the Israeli military. The Herev Battalion, also known as the ‘Druze Battalion’, is a ground force battalion in the regular forces of the IDF (Israel Defense Force), consisting primarily of Druze. Some say the name Druze comes from a Persian word "darzi" - seamster, another opinion is that it comes from an Arabic word "daresah" - those who study, and a third opinion is that it is a derivative of the word "darazo" or bliss. 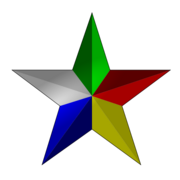 A five pointed star is the Druze religious symbol. The Druze are recognized as a separate religious community having its own religious court system. They have no political aspirations to be an independent nation. Their emphasis is on spiritual and not secular issues. The Druze religion was founded just about a thousand years ago. In general, they have chosen to keep a lot of the facts of their faith secret. A few details that about their religion: it is a monotheistic religion and four prophets carry the Druze messianic message. The first three are the biblical Moses, Jethro and Muslim Muhammad. According to the faith, the fourth prophet-Hamza Ben Ali was the strongest of the lot. He had approached an important sheik in Egypt in 1017. The sheikh had accepted him immediately, and nominated him as the spiritual leader of Egypt of the time. Hamza was a spiritual leader for twenty two years. His era was the last opportunity to join the Druze religion. After that time, you have to be born into the religion to be a part of it. Since the Druze have no ritual or ceremony in their religion, they do not have any revered or holy sites. They do hold gatherings to discussing community affairs, and over time these gatherings have taken on a special significance - a sort of religious holiday. They meet at the tombs of their prophets for these communal gatherings. Jethro's Tomb - the tomb of Nebi Shu'eib - is one of the most important Druze gathering sites is and overlooks Lake Kinneret (Sea of Galilee). Sabalan's Tomb - Sabalan was a Druze prophet, possibly Zebulun, the son of Jacob, or one of the emissaries who propagated the Druze religion in the eleventh century. Sabalan's tomb is located above the Druze village of Hurfeish. Nabi al-Khadr - Al-Khadr means "green" in Arabic. It is also the Muslim name given to the Prophet Elijah. His tomb is to be found in Kafr Yasif, near Akko. Daliat el Carmel is the largest of the Druze villages in Israel with around 15,000 residents. The atmosphere of the village is warm and open. Anybody, including the villagers, can choose either to dress traditionally or in modern clothes. The village started out as an agricultural society. The countryside is still beautiful and pastoral, yet the scene is dotted with Mercedes, upgrade shopping, and even McDonalds. In Daliat-El-Carmel, 330 of the Druze community are remembered for sacrificing their lives in defending Israel. Hospitality is a very important part of the Druze tradition. In Daliat el-Carmel, there is a colorful market or shuk offering Druze handcrafts, traditional food, Druze pita bread and more. You can tour the village's ancient quarter and the Legacy House. A short distance from the Druze villages stands the Muhraka, a Carmelite monastery, which, according to tradition, constitutes the place where Prophet Elijah battled the Baal Prophets. Around 10,00 people live in Isfiya, also on Mount Carmel, outside of Haifa, which was built on the ruins of a Byzantine settlement. In 1930, remains of a fifth-century Jewish settlement of Husifah were found in the village. They include a synagogue with a mosaic floor bearing Jewish symbols and the inscription "Peace upon Israel", and some 4,500 gold coins dating from the Roman Period. The modern village of Isfiya was founded in the early eighteenth century. Isifiya (Ussifiya) Center for Bedouin Heritage "Albadia," offers Bedouin hospitality in a traditional tent encampment where stories about the Druze community, religion and traditions are related. Shfaram, Maghar, Rama, Bet Jan, Peki'in, Ein el-Asad, Kafr Sumei, Kasra, Yanuah, Yirka, Abu Sinan, Julis, Jat and Hurfeish are the villages in the greater Haifa-Akko area. In the Golan; Majd al Shams is considered to be the center of the Druze community, Mas'ada, Buka'ata and Ein Kenya lies in the southwestern foothills of Mt Hermon, above the Banyas Nature Reserve. Traditionally Druze men shave their heads and cover them with a white turban. 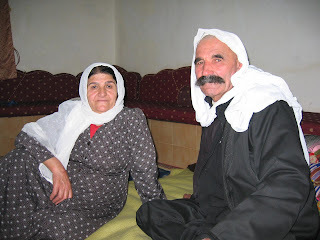 They have large mustaches and sometimes a beard; the women wear a white head scarf, called a naqab. The most pious among the women hide all their hair under a separate covering, the iraqiyah, which is fastened around the head underneath the white scarf. The rights of Druze women are almost identical to those of men.